Does This Beach Make Me Look Fat? Moving from crime fiction to the legal thriller, Edgar Award winner Scottoline (Final Appeal) fashions a stylish blend of wit and suspense. The focus of the narrative is the conclusion of a high-profile murder trial in Philadelphia. Slumlord Elliot Steere is accused of killing a homeless man during a carjacking attempt. His aggressive attorney, Marta Richter, has apparently defended him successfully. As the jury begins deliberation, however, Steere gleefully admits his guilt to her, setting in motion a complex and riveting chain of events. With the likely acquittal only hours away, Richter, furious at having been duped by her client, sets out to make amends. She drafts Judy Carrier and Mary DiNunzio to help her secretly reopen the case and search for overlooked evidence. The two young lawyers work for Rosato & Associates, an all-woman law firm Richter has retained as her local counsel for the Steere case. When Bennie Rosato (the bright and witty lawyer from Legal Tender) discovers that the two associates have disappeared and that her firm's credibility is under attack, she launches her own investigation. Meanwhile, Richter battles the clock, a blizzard and a nasty henchman dispatched by Steere (who's spending the blizzard in a holding cell). Scottoline deftly balances the varied personalities of the women and manages a large cast, including judge and jury, with precision. She skillfully depicts personal quirks that give her characters dimension: the ruthless Steere is a dedicated student of Sun-Tzu's The Art of War; DiNunzio drinks from a ""Feminazi"" coffee mug. 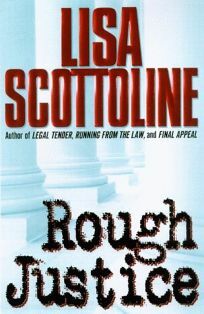 Scottoline's legal background lends verisimilitude to the story, and her skill as a novelist makes her plot sizzle with cliffhanging intensity. 75,000 first printing; $100,000 ad/promo; audio rights: HarperAudio; U.K. translation and dramatic rights: Aaron Priest Literary Agency; author tour. (Sept.) FYI: The paperback edition of Legal Tender will be published simultaneously.